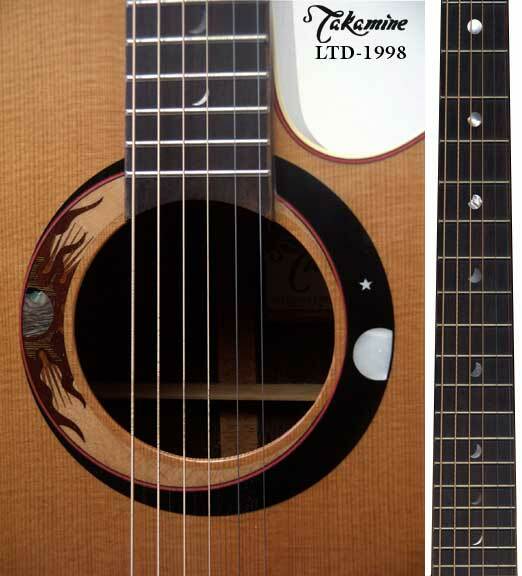 The Takamine LTD-1998 was the first model to reveal Bob's love for all things astronomical (1998). Tailored to evoke the feel of ancient astronomical charts, the rosette celebrates the Sun and Moon. Intertwining offset rings suggest the balance of day and night. The fingerboard markers animate the growing stages of a total solar eclipse - a celestial 'union' of the Moon and Sun. This dramatic inlay color scheme uses exotic woods and also incorporates abalone, mother of pearl and acrylic materials.